Spend your holiday away from the city on a trek in the scenic mountains of Sakleshpur near Bangalore. Your adventure begins with a trek to Agni Gudda, or the fiery mountain. Climbing over lush, green trails in the countryside, you'll reach the peak and enjoy stunning views of the valley. After descending down from the mountain, you'll visit the nearby Magajahalli waterfalls and take a dip in its cool water. The next day, you'll also visit the star-shaped Manjarabad Fort to explore ruins that date back to the 17th century. This Sakleshpur trek is a great option for travellers looking for a nature-rich, weekend adventure near Bangalore. A small part of the long range of the Western Ghats, the hill-station of Sakleshpur is a popular attraction for hiking enthusiasts. Located 5-hr drive away from Bangalore, the hill-station's mountains and grasslands are easily accessible. These mountains are decorated with vast plantations of coffee and spices that give an aromatic touch to sprawling expanse of the monsoon-fed forests. The waterfalls breathe away your inhibitions with cool water, making way for fun memories of a short weekend spent in nature. • Trek to Sakleshpur and reach the peak of Agni Gudda, or the fiery mountain. • Stay in a quaint home-stay at the hill-station of Sakleshpur. • Take a bath in the gushing waters of Magajahalli waterfalls. • Spend a merry night around the campfire with light music. • Visit the ruins of Manjarabad, a 16th century fort built by Tipu Sultan. Travellers are required to follow instructions of the trek leader during the Sakleshpur trek. Consumption of alcohol, drugs and tobacco products like cigarettes is strictly prohibited during the Sakleshpur trek. For cancellations made 24 hrs or more before departure of the Sakleshpur trek: 90% refund. For cancellations made less than 24 hrs before departure of the Sakleshpur trek: no refund. For cancellations made by the tour operator due to unforeseen circumstances: 100% refund. You can be picked-up from multiple pick-up points located all across Bangalore. These include: Marathahalli in Kala Mandir by 21:30 hrs, Pizza Hut near the Silk Board bus stop by 22:00 hrs, Udupi Garden bus stop in BTM layout by 22:10 hrs, Banashankari bus stop by 22:30 hrs and Gopalan Arcade in RR Nagar by 23:15 hrs. Arrive at the pick-up point in Bangalore and meet your trek leader. A private bus will pick-up your fellow trekkers as well and travel to Sakleshpur, 4-hr drive away from Bangalore. Settle in for the long drive. Overnight in transit. Reach Sakleshpur early in the morning, stop for some breakfast and begin the trek to Agni Gudda, or the fiery mountain. Climbing over lush, green trails in the countryside, you'll reach the peak and enjoy stunning views of the valley. After descending down from the mountain, you'll rest for a bit, have a simple yet delicious lunch and visit the nearby Magajahalli waterfalls. In the evening, the day ends with a merry night around a campfire with some light music and hot dinner. Overnight in a home-stay at Sakleshpur. Hike up to see breathtaking views of the valley. The day begins early in the morning with hot tea and breakfast. You'll checkout from the home-stay and travel a short distance to visit the Manjarabad Fort. Explore the star-shaped for with scenic views all around and depart for Bangalore in your private bus. You'll reach the city by 22:00 hrs, subject to traffic and road conditions. Your trip ends here. 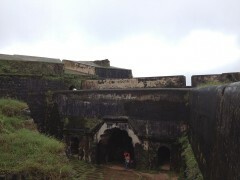 Visit the star-shaped Manjarabad Fort. Report to pick-up point and travel to Sakleshpur. No meals are provided on this day so make sure to have dinner and carry snacks for the overnight journey. Keeping a shawl is recommended for comfort. Overnight in a home-stay at Sakleshpur. Trek to Agni Gudda peak and visit Magajahalli falls. Today's meal package includes breakfast, lunch and dinner. You'll also be served some tea in the evening. You'll be accommodated in a home-stay in Sakleshpur. Travel in a Tempo Traveller to Sakleshpur. Visit the Manjarabad Fort and return to Bangalore. Today's meal package includes breakfast only. You may have lunch en route to Bangalore at your own expense. The operator will arrange your transport to the start point of the Sakleshpur trek.